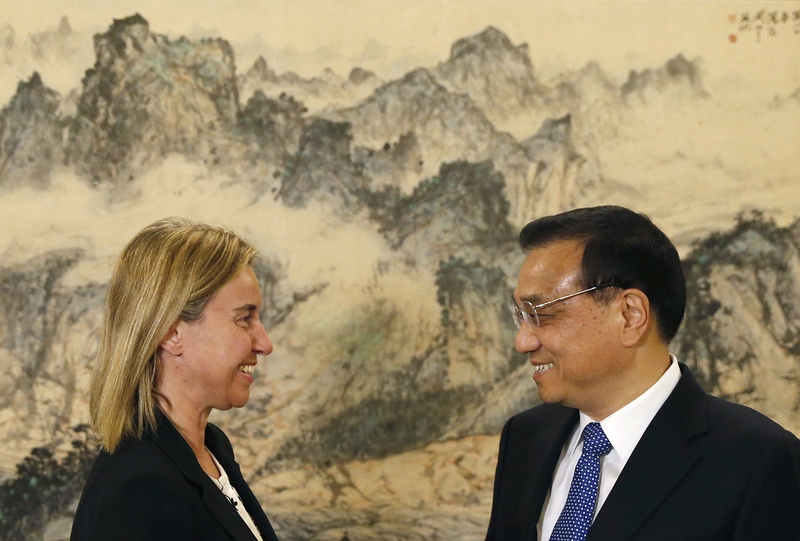 High Representative of the European Union for Foreign Affairs and Security Policy Federica Mogherini (left) meets with Chinese Premier Li Keqiang at the Zhongnanhai leadership compound in Beijing, May 6, 2015. First and foremost, let us not fall into the trap of false nostalgia. European-U.S. relationships were not quite hunky dory before November last year. (It seems to me one problem is that many U.S. readers get their “European” views through U.K. media, which itself is sadly underinformed on continental European affairs.) Geopolitically, most continental European states had looked very warily on U.S. adventurism in the Middle East, for instance. There is no shortage of trade disputes, and Europe diverges sharply from the U.S. on matters ranging from climate change to the International Criminal Court. Conversely, our relationships with China have generally been better than widely assumed or reported—even taking into account the obvious discussions about fundamental values, Dalai Lama meetings, and Nobel prizes. There are a few reasons for this. The European Union (E.U.) and China have very few geopolitical irritants between them. The high level of emotiveness, which (according to John Pomfret’s excellent recent book) characterizes Sino-U.S. relationships is largely absent in the relationship between Europe, Brussels, and member states’ capitals. Perhaps this is because Europe sees China’s rise much less as a threat than some voices in the U.S. seem to. Our style of engagement tends to be less confrontational and more collaborative: faced with intellectual property problems, for instance, the United States decided to threaten a trade war; the E.U. started funding capacity building and legal reform projects on the ground. On some policy issues, Brussels and Beijing are closer to each other than they are to Washington. That does not mean, however, relations are highly positive. There may not be great enmity felt towards China, but there is little ardent love either. The relationship remains hobbled by Brussels’ navel-gazing as it is preoccupied with its own internal crises. The labyrinthine organization of the E.U., and the complex division of relationships between the E.U. and its member states are difficult for China to penetrate, although it has proven adept in a divide-and-rule approach that seeks to pick away individual members or groups of states. The 16+1 Group is only one example of that. That said, both Beijing and Europe have been rather rattled by the instability brought by the lingering effects of the financial crisis, Brexit, and the Trump presidency. Focusing on its domestic development, China has hitherto contributed relatively little to the integrity of the international system. Now, it increasingly seems to see it as necessary and desirable that it takes up greater leadership worldwide. Since the end of the Cold War, Europe basked in the comfort of both economic prosperity and considerable national security, but sees these may not be as self-evident as once taken. The Macron-Merkel tandem will be looking to consolidate Europe’s position, while China will seek to establish its own, without ruffling too many feathers. That creates ample space for pragmatic cooperation. Paths of American and Chinese engagement with Europe are distinctively different. In fact, I wonder where the China-to-outshine-U.S. question arises in the first place. Back in the days of the Cold War, it was customary for Chinese leaders to talk about supporting European unity as a manifestation of a multi-polar world. The intended message was for Moscow, with which China had ideological and economic differences, in addition to ongoing negotiations over their shared border demarcation. Today, Europe is of course still important for China. But, it is rare to hear about Europe—either the E.U. as a multilateral entity, or specific European nations—as a geo-strategically critical being. The Trans-Atlantic alliance is cultural, in historical, intellectual, and operational senses. There is no room for China (or many others around the world, too) in that space at all. Europe does not count China as an actor in its efforts to work on keeping the trans-European continent secure from the former’s perceived threat from Russia. Nor does China take a position on Russia-Europe relations. Trade and investment continue to be the backbone of ties between China and Europe. Germany stands out in European states’ pursuit of ties with China, so much so that some European commentators coined the phrase “Berlin-Beijing Axis” to indicate their displeasure over difficulty to come up with a one-Europe approach over some specific matters. A good part of such criticism stems from built-in beliefs in liberalism. For example, both China and Germany stand accused of practicing “industrial policies,” a backward-looking notion according to many in the liberal camp of free-market capitalism. Germany’s Industrie 4.0, an initiative that aims at taking advantage of new developments in automation and IT-related technologies to make German manufacturing more competitive globally, finds a close cousin in “Made in China 2025.” As a matter of fact, the Chinese scheme has solidified the already extensive ties in manufacturing between China and Germany. If there is anything that’s outstandingly unique in the way China and Germany have been handling their bilateral economic relations—the pattern goes way back to the mid-1980s—it is that neither side places narrowing gaps in trade as a priority. Instead, they worked on finding ways to tap into each other’s market so as to strengthen their respective manufacturing capacities and increase exports. This grow-out-of-the-problem method is a different kind of results-oriented approach. The European Union has, especially in the past three decades, being a source of ideational power for East Asia. Frequently East Asian commentators lament that efforts at regional integration in Asia have Europe to look upon as a model but thus far Asia has failed to produce much to show its capacity at learning. Whatever “loss of luster” may stem from Brexit, the E.U. continues to wield a considerable amount of regulatory power over its member states, especially its newer members in Central and Eastern Europe (CEE). States and societies in the CEE hold considerable swing for China’s Belt and Road initiative. This is an important background for Li Keqiang’s routine trip to Brussels. Climate is the topic of the day, and it looks like the E.U. and China will indeed cooperate on the 2015 Paris Agreement now that Donald Trump has officially decided to pull out. A joint statement will be released, pledging to fully support the implementation of the Accord, which is good news. My own impression is that China will not go much beyond that as it copes with a slowing economic growth and needs to manage a difficult transition into a service-oriented economy. While China has become more norms-conscious lately, and is always consistent with what it negotiates, it does not like international regulators overseeing its own commitments as shown by its resistance to the South China Sea ruling by an International Arbitration Court last year. Like Zha Daojiong, I also do not believe Europe will turn to China as a “replacement” to the United States, nor do I think that Sino-European relations will outshine Sino-American relations. Granted, China’s presence in the E.U. has been rising steadily over the past decade, both in terms of FDI, people-to-people exchanges and soft power. The change is massive, when one looks at the 77 percent increase in Chinese FDI into the EU (UK included) in 2016 compared to 2015, the number of Chinese students, or the stronger presence of Chinese media and arts everywhere in Europe. The Belt and Road narrative has helped, obviously, in Europe as well as in other continents, especially as the “connectivity” concept (much liked by China and Brussels) has not led to a link between the B&R and the European investment strategy. The fascination with the United States remains intact in Chinese policy circles as well as in the general public. Every week, Chinese delegations come to Washington and New York to engage with American government or business circles. As a single country, the U.S. remains the prime recipient of Chinese FDI. The number of Chinese students there is close to 300,000 (twice as many as in the E.U.). And for all the grand talks of “strategic dialogues” between the EU and China, the real strategic relationship –a competitive one, as explained by Graham Allison—is the U.S.-China relationship. It is hard to imagine Europeans advocating a Sino-European partnership that would take the lead in creating a new world order without the U.S. I also agree with Zha that the Trans-Atlantic alliance is cultural. Europe’s main economy, Germany, will be tied to N.A.T.O. and to the transatlantic alliance for a very long time. Chancellor Angela Merkel is facing a major election in September, and security matters have become paramount. The U.K. is busy with an even more uncertain general election, and a hapless Brexit negotiation in the next two years. France, with its energetic newly-elected president, Emmanuel Macron, is keen to have a bigger impact on the world stage and is treading cautiously. China, for its part, does not like uncertainty and is only mildly reassured that the E.U. is sticking together and –above all—that the Eurozone is not about to collapse. Despite the current zeal over Sino-European relations, China cannot replace the U.S. in its entirety. Bilateral and multilateral relations are multifaceted and overly simplified in the current debate. Important security issues that require cooperation, such as the commitment to N.A.T.O. and the global threat of terrorism, need to be distinguished from other topics such as climate change or free trade. Regarding security, the transatlantic alliance may remain strong, but on free trade and climate change, European countries seem to be aligning their positions with China. Nevertheless, frictions between the E.U. and China exist on a number of issues, including market access, the rise of Chinese investment into economic sectors perceived as sensitive, and the question of China’s Market Economy Status. Currently, Berlin and Beijing are both signalling strong interest in enhancing cooperation. On the paramount issue of trade and investments, Germany can and must leverage its economic weight in relation to China. Germany is well-positioned to promote international economic stability, free trade and a healthy global investment climate. Using its G20 presidency this year, it can set the 2017 trade agenda and adopt a counter-position to U.S. protectionism. Merkel can take up initiatives shaped by China’s G20 presidency last year, and use those initiatives to exert pressure on the Chinese government to follow through on its pledges of free trade, a more level playing field domestically and greater reciprocity vis-à-vis China-bound investment. The upcoming G20 summit in Hamburg, in combination with Germany’s leadership and a coordinated EU approach, creates an opportunity for E.U.-China relations to leap forward. A coordinated E.U. approach is particularly necessary to dispel fears of a Chinese divide-and-conquer strategy targeting European countries. These are voiced in the context of the One Belt One Road initiative, but also in the creation of 16+1 as a forum for C.E.E. countries. Our analysis on Sino-European cooperation in infrastructure investments shows that infrastructure is a neglected area, which needs to be better coordinated across E.U. member states, in particular for cross-border projects, where there is potential for greater cooperation. However, these projects will depend on the future of the Chinese economy. In line with Philippe Le Corre’s comments, China will be cautious in delivering on its international promises, in light of an economic transition and dwindling growth figures closely scrutinized by domestic and foreign observers alike. Scepticism is warranted, as economic reforms remain sensitive for the Chinese government, which must strike a balance between decelerating growth and maintaining social stability. In the near future, China must prove its ability to: deal with overcapacities, especially in the bloated coal and steel industries; limit the environmental impacts of its economic policies; and, address the economic disparities between the eastern, central and western parts of the country. This week presented an opportune moment for E.U. and Chinese leadership to demonstrate their mutual commitment to bolstering cooperation. And in the wake of the US abandoning its post on global climate protection, the E.U.-China Summit and China’s meetings with European heads of state proffer greater potential for Sino-European relations ahead.